December 21, Teen Vogue: "The global plastics crisis... is far greater than a consumer-behavior issue, like recycling: It is directly connected to the fossil fuel industry and to climate change, as 99% of plastics are derived from chemicals found in fossil fuels. Despite a recent United Nations climate report that says we only have 12 years to radically transform our entire economy to prevent the worst possible impacts of climate change, plastic production is set to ramp up, tripling the amount of plastic exports by 2030." December 19, Zero Waste Europe: The European Union has agreed upon laws to slash single-use plastics, including bans on "single-use plastic cotton buds, straws, plates, cutlery, beverage stirrers, balloon sticks, oxo-degradable plastics, and expanded polystyrene food containers and beverage cups." All beverage bottles must have 30% recycled content by 2030. Also included is extended producer responsibility (EPR) for plastic cigarette filters ("big tobacco pays"), fishing gear, and certain single-use packaging by 2023: manufacturers will pay the costs of waste management, clean up and awareness-raising for certain single-use plastics. "Member States will have two years to transpose it into national laws, which should come into force at the beginning of 2021 at the latest." Read the press release from the European Commission and more from the European Environmental Bureau. In addition to bans and fees on problematic products and packaging, several cities are also pursuing legislation that would force companies to pay for managing the waste created by their products instead of foisting disposal costs onto the consumer, thereby motivating them to change their manufacturing and delivery systems to eliminate or drastically minimize waste. 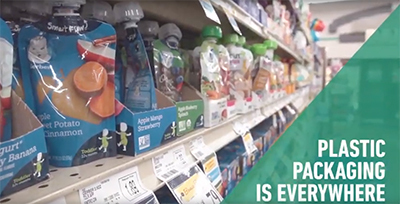 This holiday season, the greatest gift manufacturers can give consumers is the option to buy their products without ending up with a recycling bin full of single-use plastic packaging destined for the burner or the dump. As the saying goes, “necessity is the mother of invention”. China’s National Sword policy gives us the opportunity to kick our society’s plastic habit once and for all and to put pressure on those most responsible for it: not consumers, not cities, but producers." December 24, San Francisco Chronicle: The president and CEO of Recology, Inc., an employee-owned company providing waste and recycling services in California, Oregon, and Washington wrote that if "the plastics industry is unable to step forward with a set of policies and programs that reverses these unfortunate trends, Recology will work to place a comprehensive policy on the next statewide California ballot — building off the EU model. We are prepared to commit $1 million toward a signature-gathering effort to that end and will work with all who are willing to move this effort forward. With plastics, as with so much else, California may need to lead the way." January 6, CBC: "The recycling market has become more saturated, forcing municipalities to change what they collect..."
Tetra Pak told the Guardian that they are recycling 18,000 metric tonnes of cartons a year, with 93,000 packs per tonne, which would mean that they are currently recycling about 20% of their output..."
"Recycling Tetra Pak cartons is possible, but only if you have the right systems and technology in place. In the past, we bought Tetra Pak waste directly from Tetra Pak, and we also bought milk cartons from informal collectors and litter pickers across the country. But the latter has proved financially ineffective, and it was impossible for us to make a profit," according to the carton recycling plant manager. These days, the Dong Tien plant only accepts waste materials sent directly by the Tetra Pak-affiliated dairy companies themselves. “Between 30% and 50% of the product is aluminium and plastic, and the rest is paper,” says Quyet Tien. “But it’s not simply a matter of mashing the cardboard down or melting the plastic – we have to extract each separate layer and treat them all in different ways.” The process still isn’t cost-effective he says, but it’s their social responsibility to do what they can to help the environment – even if it’s not enough. "We’d love to be able to recycle the cartons that people use and throw away afterwards – I’m sure many recycling plants would – but we get very little support from Tetra Pak themselves and we’re not a charity." "The result? A country festooned with empty milk cartons. You’ll see clusters outside primary schools and nurseries: one million primary school children get a free carton of sweetened milk at school every day, thanks to a Tetra Pak-supported governmental project. A waste education programme is being piloted in 30 kindergartens, but what happens to the five million cartons at the end of each school week still depends on the institution. "We try to use as many cartons as we can for our arts and crafts lessons," says Phung Thi Dung, 38, who has been working as a primary school teacher in the Ba Ria province for ten years. "But the rest just get thrown away. I’m not sure where they end up." National Geographic has created a Plastic or Planet series, a "multiyear effort to raise awareness about the global plastic trash crisis... find out what you can do to reduce your own single-use plastics and take your pledge." The PaintCare Innovative Recycling Grant Competition to "identify and help develop the best ideas for recycling leftover latex paint" is open to applications from either individuals or organizations located in one of the 50 United States or the District of Columbia until March 22, 2019; grants to be awarded "by April 30." Acccording to Waste360 "PaintCare will conduct three separate competitions using funding from the PaintCare recycling programs currently operating in California, Colorado and Connecticut. The winner of each competition will be awarded a grant of up to $100,000 for a technology that is expected to return benefits to the state that contributed the funding." PaintCare is the nonprofit paint stewardship organization which operates programs in 8 states and DC. Carpet America Recovery Effort (CARE), the carpet stewardship organization operating California's carpet stewardship program, has grants open: Cycle 3A (Capital Improvement – due Jan. 18, 2019) as well as Cycle 2M (collections and reuse microgrants), which "will accept applications through 2019 and the application is quite short with a one-page excel budget sheet... scroll down to Cycle 2M, about halfway down CARE's grants page." GAIA is hiring a US Program Director as well as a Global Plastic Policy Advisor to "support the movement against plastic pollution in key national and international (UN) policy spaces, via the provision of science and technical expertise, and support for the development of a collaborative, proactive, and interconnected government and corporate-facing strategy" due Jan. 13, 2019. GAIA is a "worldwide alliance of more than 800 grassroots groups, non-governmental organizations, and individuals in over 90 countries whose ultimate vision is a just, toxic-free world without incineration." Subscribe to the NWPSC Newsletter and read our past newsletters. For current subscribers: update your email, password, or unsubscribe on the Subscriber Preferences Page (you will need to use your email address to log in). If you have questions or problems with the subscription service, please visit subscriberhelp.govdelivery.com.